This system indicates the proximity of an obstacle (person, vehicle, tree, gate, etc.) which comes within the fi eld of detection of sensors located in the bumper. Certain types of obstacle (stake, roadworks cone, etc.) 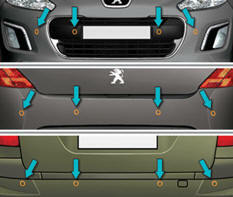 detected initially will no longer be detected at the end of the manoeuvre due to the presence of blind spots. This function cannot, in any circumstances, take the place of the vigilance and responsibility of the driver. The system is switched on by engaging reverse gear. This is accompanied by an audible signal. The system is switched off when you exit reverse gear. The proximity information is given by an intermittent audible signal, the frequency of which increases as the vehicle approaches the obstacle. The sound emitted by the speaker (right or left) indicates the side on which the obstacle is located. When the distance between the vehicle and the obstacle becomes less than approximately thirty centimetres, the audible signal becomes continuous. This supplements the audible signal by displaying bars in the multifunction screen which move progressively nearer to the vehicle. 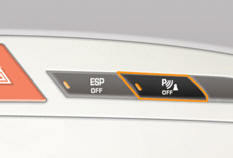 When the obstacle is near, the "Danger" symbol is also displayed in the screen. In addition to the rear parking sensors, the front parking sensors are triggered when an obstacle is detected in front and the speed of the vehicle is still below 6 mph (10 km/h). The front parking sensors are interrupted if the vehicle stops for more than three seconds in forward gear, if no further obstacles are detected or when the speed of the vehicle exceeds 6 mph (10 km/h). The sound emitted by the speaker (front or rear) indicates whether the obstacle is in front or behind. The function is deactivated by pressing this button. The indicator lamp in the button comes on. Pressing this button again reactivates the function. The indicator lamp in the button goes off. 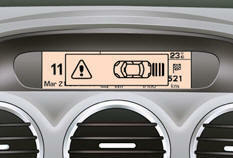 The function is deactivated or activated via the vehicle configuration menu. The status of the function is stored when the ignition is switched off. For more information on access to the parking sensors menu, refer to the section covering the configuration of vehicle systems. The function will be deactivated automatically if a trailer is being towed or a bicycle carrier is fitted (vehicle fitted with a towbar or bicycle carrier recommended by PEUGEOT). In the event of a malfunction of the system, when reverse gear is engaged this warning lamp is displayed in the instrument panel and/or a message appears in the screen, accompanied by an audible signal (short beep). 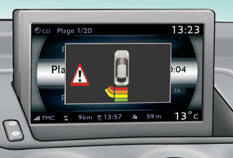 In bad weather or in winter, ensure that the sensors are not covered with mud, ice or snow. When reverse gear is engaged, an audible signal (long beep) indicates that the sensors may be dirty. When the vehicle is moving at a speed below 6 mph (10 km/h), certain sound sources (motorcycle, lorry, pneumatic drill, etc.) 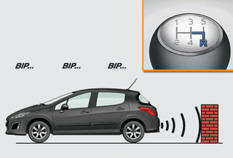 may trigger the audible signals of the parking sensor system.